In 1977, a 9 year old boy drew a 200 page comic book of his favourite movie. Its rediscovery more than three decades later has become a source of inspiration for the disillusioned adult who created it. Original ‘Star Wars Age 9’ (comic) autographed by Kenny Baker, the man inside R2-D2. 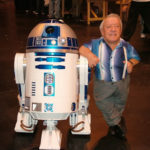 I’m so sorry to hear that Kenny Baker passed away yesterday, at the age of 81. He was, by all accounts a very nice man. In fact, out of the main 1977 Star Wars main cast, I don’t think I’ve ever heard anything but good things about him. For that alone, he was a great ambassador for Star Wars. A lovely shot of Kenny and R2. (Photographer unknown unfortunately). I almost met Kenny, once. It was my first Star Wars convention—or any kind of Con for that matter. It was Invasion, the Irish Star Wars convention which has been running for a few years in Ireland and Northern Ireland. There was a queue of folks all day long at his desk, but I didn’t join it. I’d never met a celebrity before, never mind asked for an autograph. I partly felt silly about doing such a thing, partly wondered what I might say to him which could possibly be interesting, but I also worried about meeting a childhood hero and being disappointed. This was when the comic gained a feeling of authenticity and ‘history’.